Let’s face it. Most children do not arrive in this world universally loving their veggies. Getting there can be a slow process. And for some kids (and some veggies), the process is longer than for others. 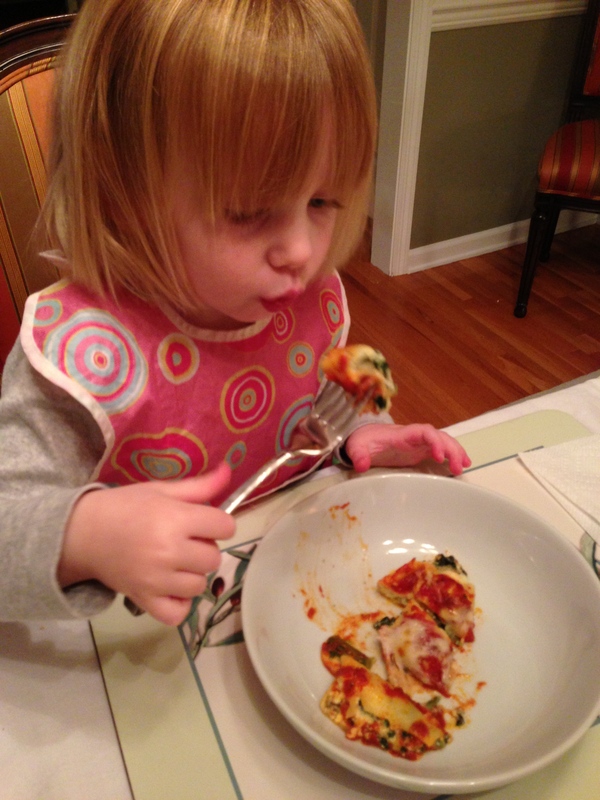 Supertaster or not, your child may occasionally approach their leafy greens with more aggression than anticipation. Why not harness that energy with a little invitation to, quite literally, pound their vegetables. A spinach-basil pesto that even those supertasters can get behind. Get the recipe here. I feel like I should use my best infomercial voice when I say this post is “two, two, two recipes in one.” The first recipe is for homemade pasta, which, if you’ve never tried to make it, is much easier than you undoubtedly think. 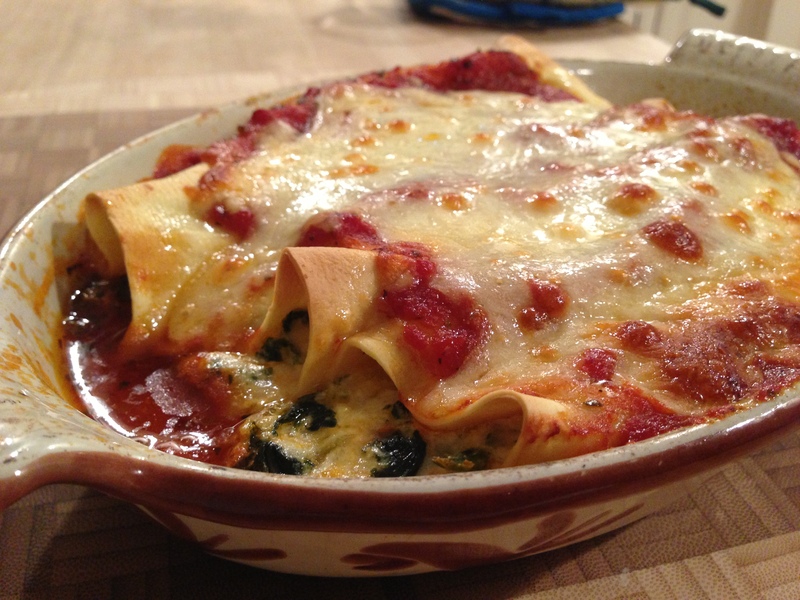 The second is for the manicotti filling — rich, creamy, and, in this case, packed with spinachy goodness. If you decide to give this a go you’ll definitely be rewarded. Fresh pasta is tender, silky and delicate, with a flavor unrivaled by dried pasta. Pair that with a savory manicotti filling highlighted by the tang of fresh ricotta and parmesan, the smoothness of fresh mozzarella, and the brightness of spinach and onions, and you’ve got a winning dish. Homemade pasta is one of those things that, when you find out how easy it is to make, will have you rolling out batch after batch. How easy? Try four-ingredient easy…or even three, if you’re a purist and omit the olive oil. It also lends itself to a bit of experimentation once you get the hang of it, adding fresh pureed spinach or chopped herbs to the dough as desired. But…there is a little bit of a time investment in making your own pasta, and you’ll need some specialized equipment in the form of a pasta machine (or a lot of patience, flour for dusting, and a good rolling pin). My pasta machine has followed me around since college and is none the worse for wear over the years. It’s also one of those things that can sit in a cabinet for months, years even, waiting for inspiration to strike. Which is what happened recently. It had, in fact, been years since I last made pasta, but Daughter 1 expressed an interest. More of a curiosity, really, when I decided to use up the last of this fall’s butternut squash to make ravioli (a post, perhaps, for another day…once we perfect the filling). I should have realized just how much fun it is for kids to not only make dough, but to roll the dough through a hand-cranked pasta maker into progressively thinner and thinner — and longer and longer — sheets. Both our girls absolutely loved helping me, improvising by making “crackers” with the dough scraps and rolling and re-rolling any bits they could get their hands on. And no, no fingers were crushed in the process. Whew! 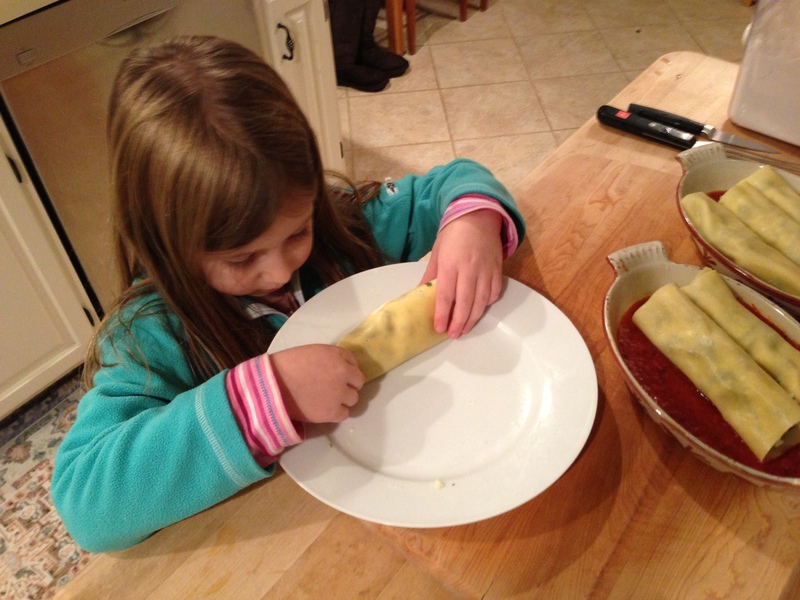 So, manicotti seemed like the perfect kid-friendly project. Once you roll out the long sheets of dough it’s easy enough to cut them into six-inch sections. Then it’s just a quick swim in boiling water before being stuffed and baked. This same pasta recipe, however, can be used for making plain old pasta, to be cut down into spaghetti or fettuccine and doused with a butter/garlic sauce or a ladle of marinara. But back to the manicotti. I liked this filling for several reasons. Even though we included some meat in our batch it’s easy enough to leave the meat out for a vegetarian manicotti, which I think I prefer. We used extremely fresh ricotta and mozzarella from Fulper’s Dairy Farm, currently available at the Slow Foods Central New Jersey Winter Market among other places. The spinach we used was frozen, but you could use fresh chard or kale if you have it on hand. Just be sure to wilt it in a hot sauté pan first and squeeze out as much liquid as possible before adding it to the recipe. I had a couple of champion rollers in our kitchen. 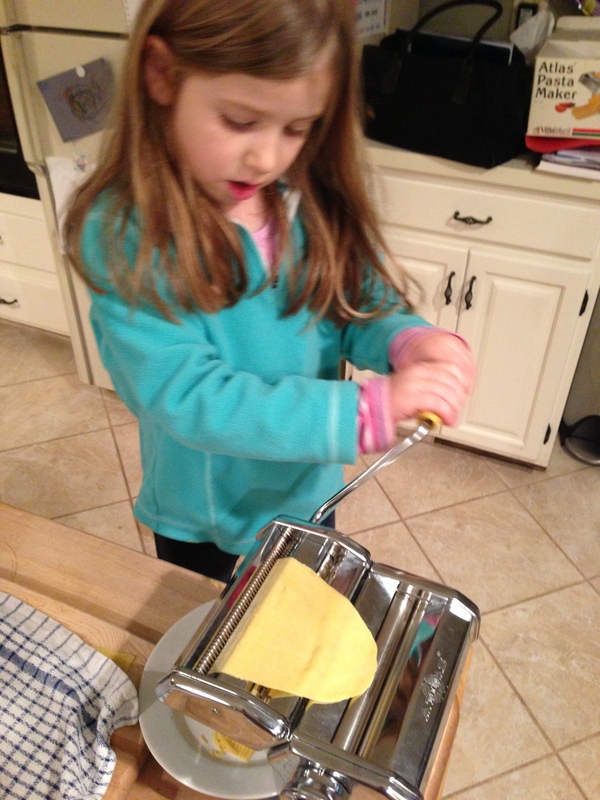 Daughter 1 manned the pasta machine, and then did double duty by instructing Daughter 2 on how to fill and roll the manicotti (they are going to put me out of a job soon; good thing I’m still needed to boil water and work the oven). Daughter 2 impressed me with how carefully she spooned the marinara sauce over the finished rolls, and they both put on the finishing touches with a generous sprinkle of grated mozzarella. We will definitely make this dish again. Now that I’ve dusted off the pasta machine I’ve got all sorts of pasta adventures in mind. But if you don’t have a pasta machine or are short on time, don’t let that stop you. A good-quality dried lasagna noodle can sub for the homemade pasta sheets — just boil the lasagna noodles longer, until they are al dente. That quick swap will definitely get this dish on the table quickly, and may just save your sanity on a packed weeknight. One final note on the below recipe: the amounts here will make approximately 12 generously-filled manicotti, feeding 6 – 8 people. If you have fewer mouths to feed (and don’t want to make extra and freeze them, which you could easily do), I suggest making the full batch of pasta dough and only use half of it for the manicotti — it’s kind-of difficult to put in one and a half eggs, and two eggs will make this dough a little too wet. Then halve the filling amount. You’ll get 6 – 7 manicotti that way, and some dough to be rolled out and cut the next day for a big batch of fettuccine. Begin by making the pasta. Mix together the flour and the salt and, on a large, clean surface (a large cutting board or marble slab works well). Mound the flour into a hill and then make a deep well in the center of it…large enough to hold the eggs. Break the eggs into the well, add the olive oil, and begin to slowly beat the eggs with a fork. 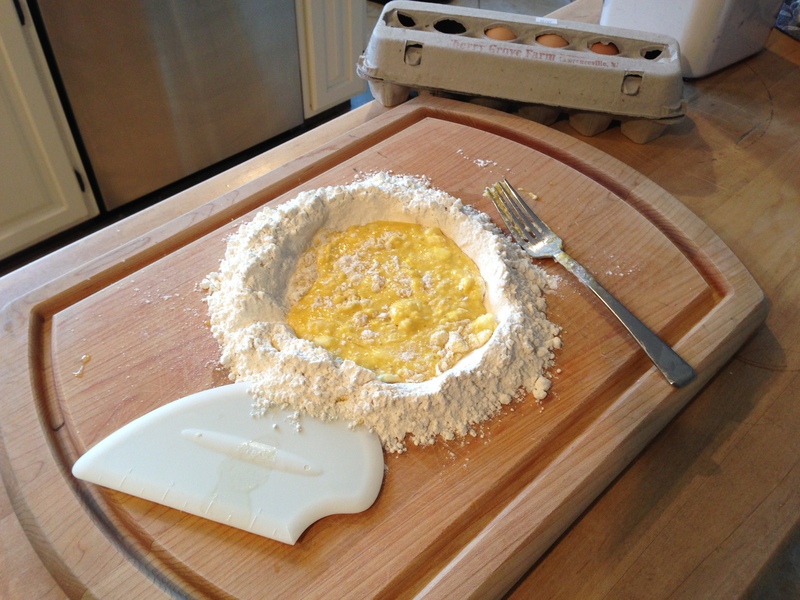 Working carefully, begin to incorporate a little flour at a time into the eggs until a loose dough forms. When the dough is too stiff to use a fork any longer, begin using your hands to knead the dough, using the heel of your hand to press the ball of dough away from you and your finger tips to bring the dough back towards you. When all ingredients are well incorporated and the dough is stiff but still pliable, wrap it in plastic wrap and refrigerate it for at least 30 minutes and up to several hours. 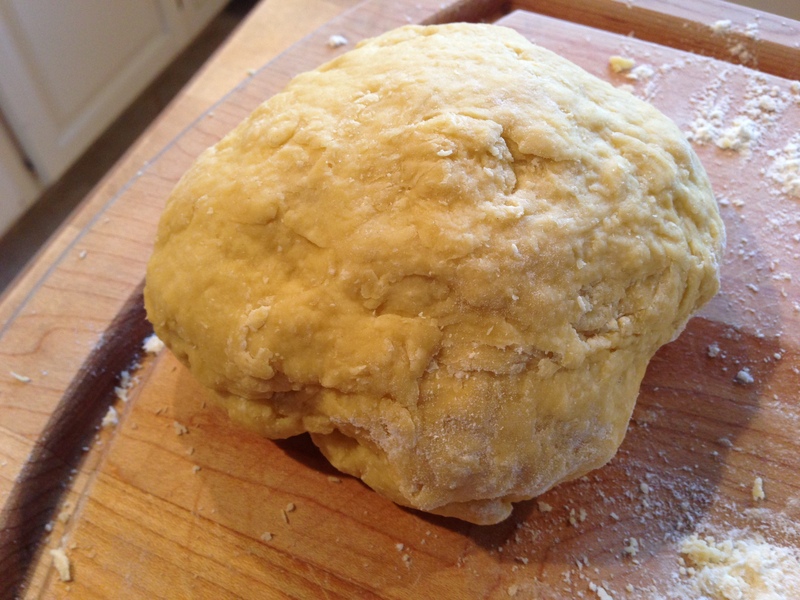 During this time the gluten strands will relax and the dough will become softer. It’s much easier to work with a dough that has rested because it won’t spring back when it’s rolled out. 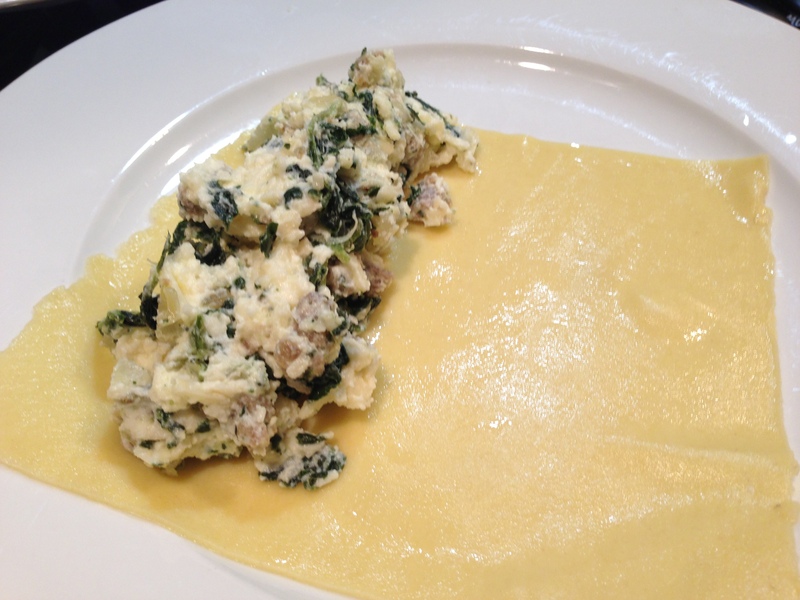 While the pasta dough is resting, make the manicotti filling. Begin by sautéing the onions in 1 teaspoon olive oil in a sauté pan over medium heat. Add the drained and squeezed spinach to the onions and stir well, breaking up any large clumps of spinach. Add the garlic, stir, turn off the heat and allow the mixture to cool. In a medium mixing bowl, mix together the ricotta, 2 cups of mozzarella (save the additional 2 cups for sprinkling on top of the rolled manicotti), the parmesan, eggs, salt and pepper to taste, and any cooked and cooled meat you are using. Stir in the cooled onion/spinach mixture. Set aside until the pasta is ready. Meanwhile, fill a large stockpot with water, salt it liberally, and bring to a boil over high heat. At the same time, preheat oven to 375 degrees and prepare a large Pyrex baking dish (4.8 quart, if you have it, or two 2-quart baking dishes…or whatever baking sheets you have) by ladling in several large spoonfuls of the marinara sauce, enough to coat the bottom of the baking dish(s). Getting back to the pasta dough, remove it from the refrigerator after it has rested. Working with one-quarter of the dough at a time, run it through the roller of your pasta machine on progressively more narrow settings, going through the press twice on each setting. You do not need to go to the narrowest setting (which is “7” on my machine, but “9” on newer Atlas pasta machines) — this is a little too thin for the manicotti. After the last time through the roller you’ll have a very long strip of dough that is 6-inches wide and many, many inches long. Lay it out on a flour-dusted surface (don’t allow dough to double over on itself or for the raw pasta sheets to touch one another…they will stick like crazy). Trim the uneven ends and, using a ruler, cut approximate 6-inch sections to make 6-inch by 6-inch pasta squares. Keep pasta squares separated from one another but covered with a clean, damp kitchen towel. Repeat these steps for the remaining dough quarters. You’ll get approximately 12 – 14 pasta squares in total. When all your pasta sheets are cut, cook them by briefly sliding them, two to three at a time, into the stockpot of boiling salted water. They only need to cook for a minute or two. When they rise to the surface remove them with a slotted spoon and place on a clean plate or baking sheet. Fill each manicotti by spooning a generous amount (between 1/4 cup and 1/2 cup) of the filling along one side of each pasta square and rolling it up to enclose the filling. 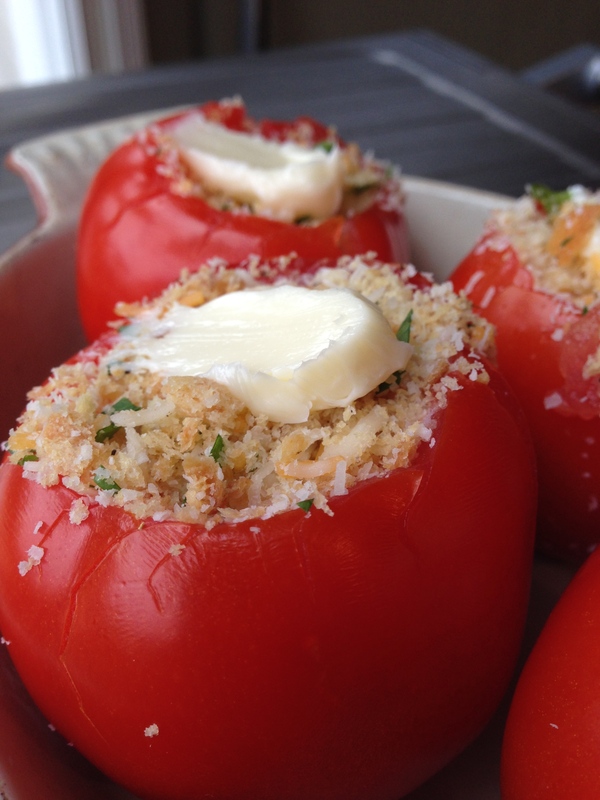 Place it, seam side down, into the marinara sauce in the bottom of your baking dish. 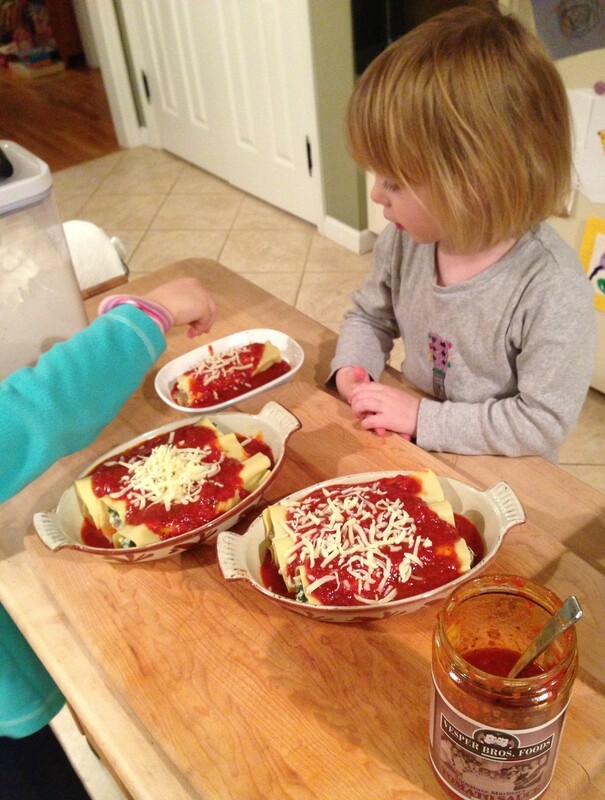 Continue to fill manicotti and line them up in the baking dish…or dishes, depending on what you have on hand. When all the manicotti have been filled, spoon the remaining marinara sauce over the top and then sprinkle with the remaining grated mozzarella cheese. If you want, drizzle a little olive oil over any exposed pasta at the ends of the manicotti (where the sauce doesn’t coat the noodles). Place the baking dish onto a baking sheet (helps protect your oven if the sauce bubbles over) and bake for 45 minutes to one hour at 375 degrees. Dish is ready when the sauce is bubbling, the mozzarella cheese is melted, and the manicotti at the center of the baking sheet are hot. During the last minute or two of baking you may want to broil the top to slightly brown the mozzarella. Be careful not to burn the cheese. 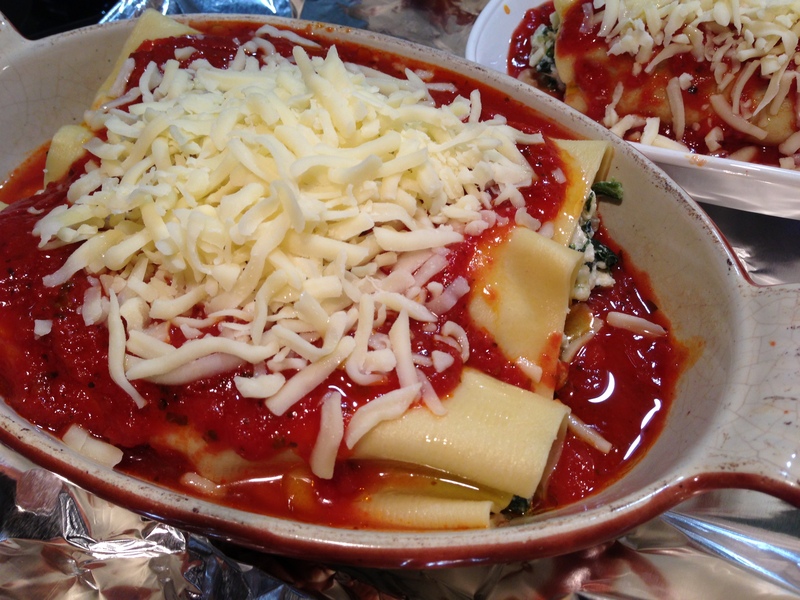 Remove from the oven, allow to cool for about 10 minutes (or the manicotti filling will be quite loose), and serve. Kid rating: four stars. Daughter 1 prefers this dish without meat. She’ll eat two helpings. She doesn’t rate the meat version quite as highly though. 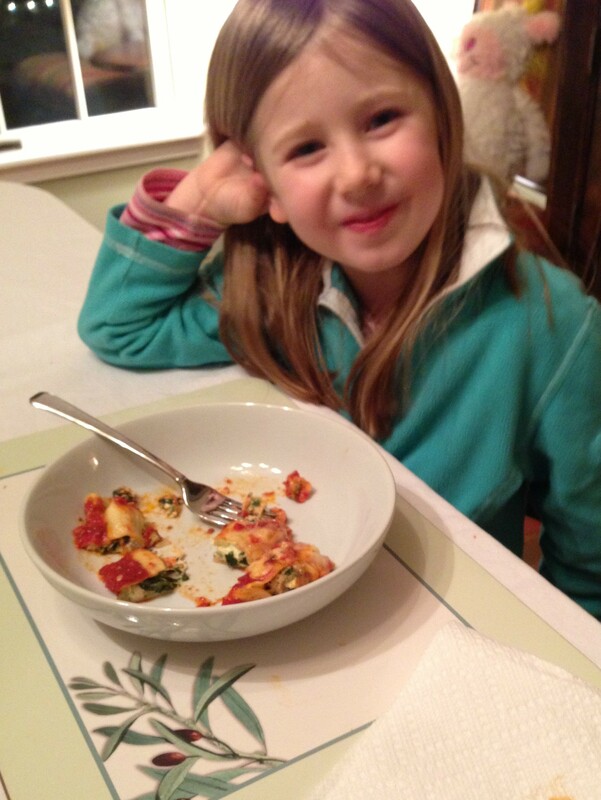 Daughter 2, who normally professes not to like spinach, cleaned her plate. Parent rating: four stars. This is like an easy lasagna, and we have in fact used the filling for lasagna before. Rolling it in delicate pasta sheets somehow makes this dish even better. Great winter meal. Warm and warming, and everyone can lend a hand getting it ready. 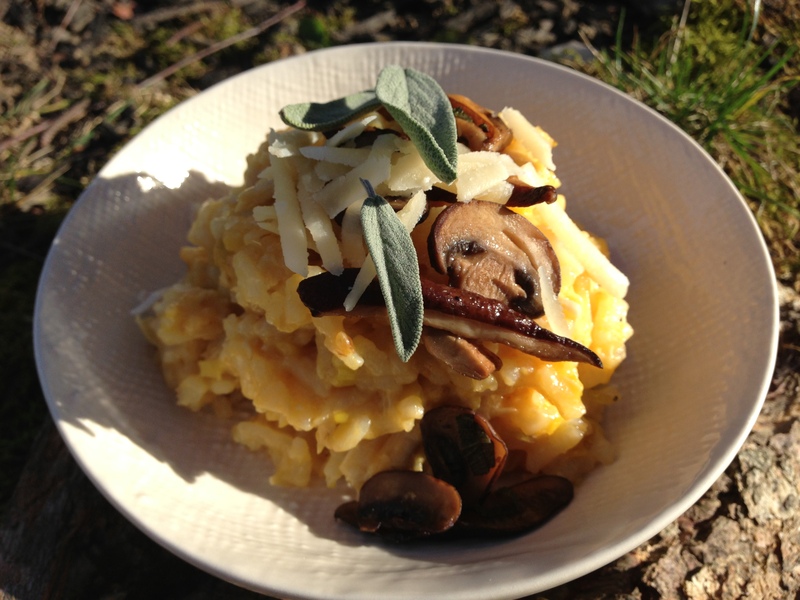 Risotto, as I’ve mentioned before, is one of our go-to dishes. Our daughters will reliably devour bowls of this stuff. It’s as much a comforting family meal as it is a crowd pleaser and it takes no more time to prepare a monster pot than it does four servings, give or take the slight amount of extra effort to chop a few more veggies. This past summer we had it with fresh corn and herbs and now, with autumn squarely upon us, we’ve reinvented it with more hearty seasonal ingredients like butternut squash, leeks, mushrooms and sage. Hey big boy, come here often? We picked up most of the ingredients for this version at the West Windsor Community Farmer’s Market in our own back yard. I’m kind-of bummed that this coming Saturday is the last day the market is open for the season, but was really happy to hear that there will be a slow food winter market opening soon to get us through the colder months. 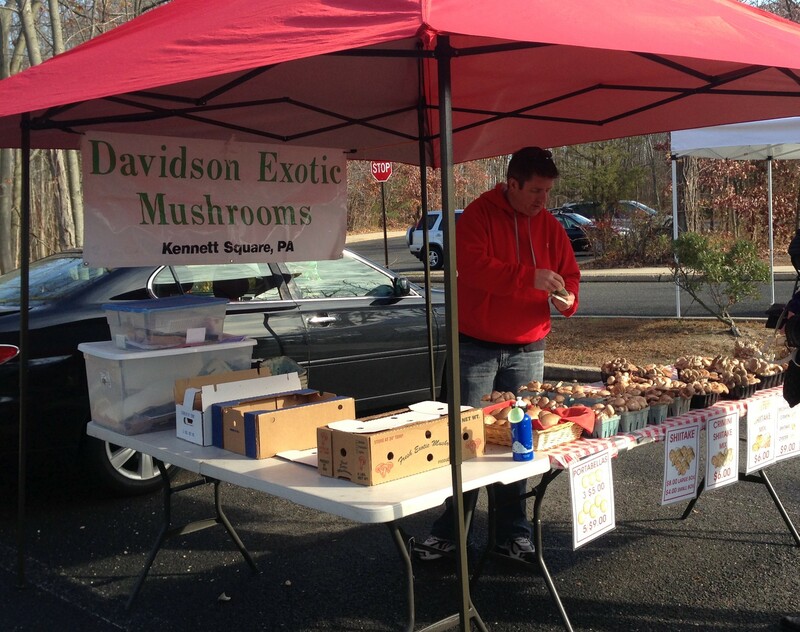 The butternut squash and the leek were from Jeff’s Organic Produce in Monroe, NJ, and the mushrooms from Davidson Exotic Mushrooms in Kennett Square, PA — that mainstay of mushroom production. I’ve got to admit that risotto was not on my mind as I shopped, but I’m also a believer in the “things that grow together, go together” philosophy…both geographically and seasonally. So with these goodies in the larder and some leftover baked chicken to use up, a plan came together quite nicely if I do say so myself. By the way, I baked the butternut squash in advance as part of another dish, but if you either don’t have the time or don’t want to go through the effort of baking a whole squash for a measly half-a-cup of squash flesh, you can use about half-a-cup of frozen butternut squash cubes and this dish will turn out just as well. You can also increase the amount of butternut squash in this recipe (either from a baked squash, or the frozen cubes) quite easily if you’re a fan. Our girls are still working on their squash taste buds so I held back a bit. 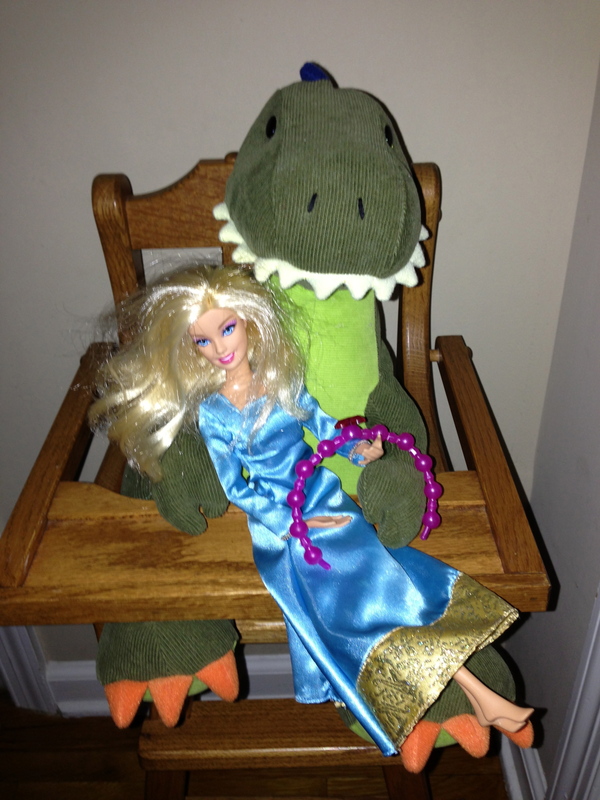 Maybe it would help if I told them Barbie LOVES squash (she does, doesn’t she?). I was also judicious in how we incorporated the mushrooms, but more on that in the recipe below. Begin by melting 2 tablespoons unsalted butter in a medium sauté pan over medium heat. When bubbling, add the leeks and a generous pinch of salt. Sauté, stirring often, until the leeks are quite soft. Do not allow the leeks to burn or scorch or they will be bitter. Reduce the heat to medium-low or low if that begins to happen and stir to redistribute the leeks in the pan. When the leeks are soft and almost done cooking — this could take 10 minutes or so — heat the grapeseed oil and 1 tablespoon butter over medium-high heat in a pressure cooker. (If you don’t have a pressure cooker, take a look at this Laid-Back Risotto recipe from Mark Bittman on the New York Times web site and adjust this recipe accordingly for the stove top…it will take a little longer, but not too much.) Add the Arborio rice and sauté for about 1 minute, until the outer covering of the rice grain turns slightly translucent. Add the leeks, stir, and then deglaze with the white wine or vermouth — whichever you are using. Allow the wine to evaporate slightly and add the butternut squash, stir, and then add 3 1/2 cups chicken stock. Place the lid on the pressure cooker, secure, and bring the pressure cooker to high pressure for 4 minutes. Meanwhile, wipe clean the sauté pan used to sauté the leeks and, over medium heat, melt 1 tablespoon butter. When foaming, add the mushrooms and a generous pinch salt. Sauté, stirring frequently, until the mushrooms start to brown. Continue to cook until all the mushrooms are golden, adjusting the heat as necessary to keep them from burning (you can add a little more butter if necessary). Add the chopped sage, stir, and deglaze the pan with the sherry. 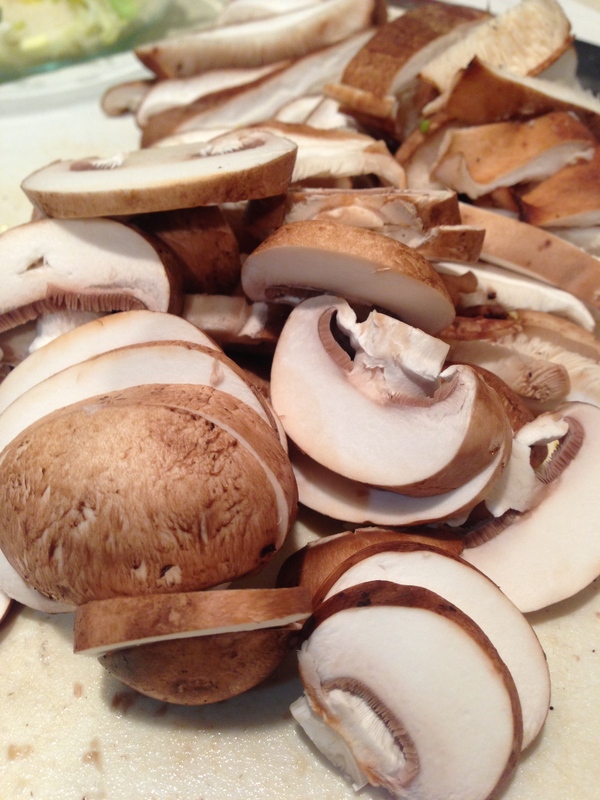 Allow sherry to evaporate and take the mushrooms off heat. When 4 minutes are up on the pressure cooker — and this will probably happen at some point as you are sautéing the mushrooms — carefully release the pressure and remove the lid. Stir the risotto, adding more chicken stock over medium heat as necessary until the rice is tender but al dente. If you’re making this on the stove top instead of a pressure cooker, just keep adding warmed chicken stock to the rice until it is creamy and al dente. Add the shredded chicken to the risotto and mix well. Off heat, add the Parmesan and cheddar cheeses and remaining 1 tablespoon butter and stir well. Add salt and pepper to taste. There are several options for plating this dish. You can either fold the mushrooms into the risotto at this point, or you can serve the risotto topped with a scattering of mushrooms and a sprinkle of Parmesan and a sage leaf or two. Which is what we did, since our girls don’t care for mushrooms very much. The parent portions got mushrooms, the kid portions did not. 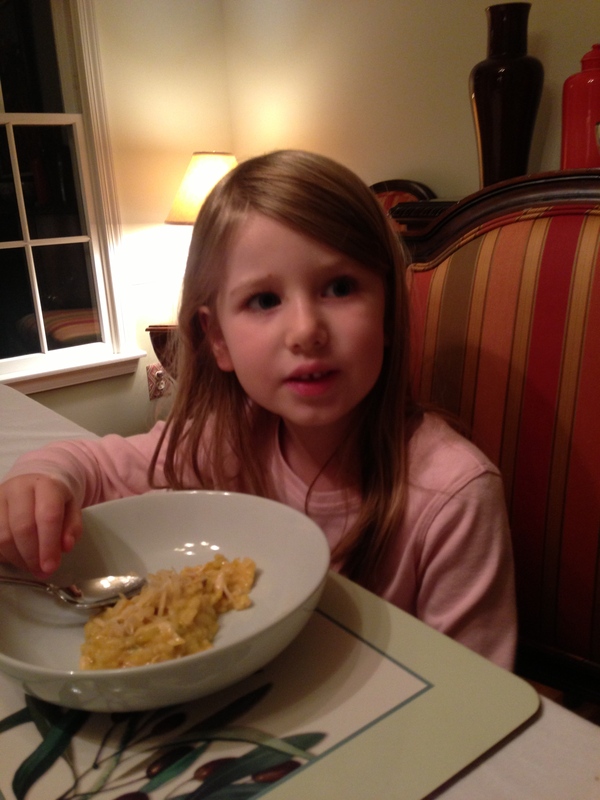 Big bowl of risotto – are you sure there is squash in here? Parent rating: four and a half stars. If we didn’t love risotto so much we probably wouldn’t make it as often as we do. This version is especially warming and comforting without being too heavy. The mushrooms, with their buttery, sage-y, slightly sweet finish really enhances the overall dish for the adults in the house. I think this was on the table in 30 minutes, even with the Barbie distractions. Kid rating: four stars. Daughter 1 asked me more than once whether there was actually any squash in this dish, and she said that in a good way. 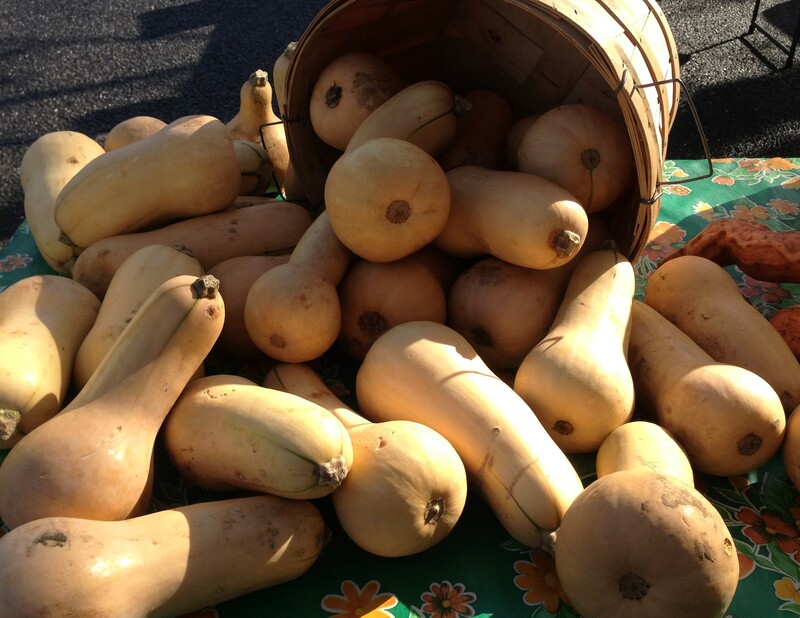 Which probably means there was not enough squash in the dish if you know what I mean. We got a thumbs up from her. Daughter 2 ate almost her entire portion and didn’t seem to care about the squash one way or the other. One clean and one almost-clean plate equals success. We can now get back to the Barbie wars. * To bake a butternut squash, preheat oven to 375 degrees. Halve the squash lengthwise, scoop out the seeds, oil the cut side of the squash and place it, cut side down, on a baking sheet. Place the baking sheet in the oven for 45 minutes to one hour, until you can easily pierce the skin of the squash with the sharp tip of a knife and meet no resistance. Remove from oven and allow to cool before scooping flesh out of the squash shell. This was one of those shot-in-the-dark dishes that, through the miracle of presentation and some phenomena that must have included the stars and moon aligning, made it past the lips of BOTH daughter 1 and daughter 2 (who asked for seconds!) and left me, frankly, both surprised and giddily smug. The definition of a seasonal vegetable here in the Northeast, zucchini are ridiculously prolific for two short months before retreating to greenhouses and other warmer climes. They are wonderful when harvested small — a pound at the most — and are tender with a pleasingly bitter finish. Sautéed, fried, stuffed and baked, in a bread or gratin or strata…nearly all preparations call for baking a zucchini, and they can all be lovely. But there is one presentation that, I think, really allows the zucchini to shine for what it is, and that is thinly sliced and raw, with a simple dressing and even simpler adornments. A carpaccio. It is here that I must pause and share that, despite the tasting rule, daughter 1 VASTLY prefers cooked veggies to raw. Other kids gobble up crisp carrot sticks. Not her, but dump them in a pot of boiling water and she’s a happy camper. This week alone I had to toss two Zip-Lock bags of fresh carrots and cucumbers that came home, uneaten, from school lunch. So I wasn’t holding out hope when I served raw zucchini. Cooked zucchini rarely gets a second look, so why would its ugly step-sister the zucchini salad get invited to the ball? Why indeed. But this dish, like Cinderella, will get invited to the palace for keeps. Give it a try: it might be your Cinderella dish too, and who couldn’t use a little happily ever after these days? Start by thinly slicing the zucchini — I used an inexpensive mandolin that makes even slices quite quickly. Liberally salt the zucchini slices and place them in a colander to release a little moisture. After about 30 minutes rinse the zucchini, pat dry with a clean tea towel, and arrange overlapping slices on a serving platter. Make the dressing by combining the lemon juice, olive oil and pepper into an emulsion and pour over the zucchini. 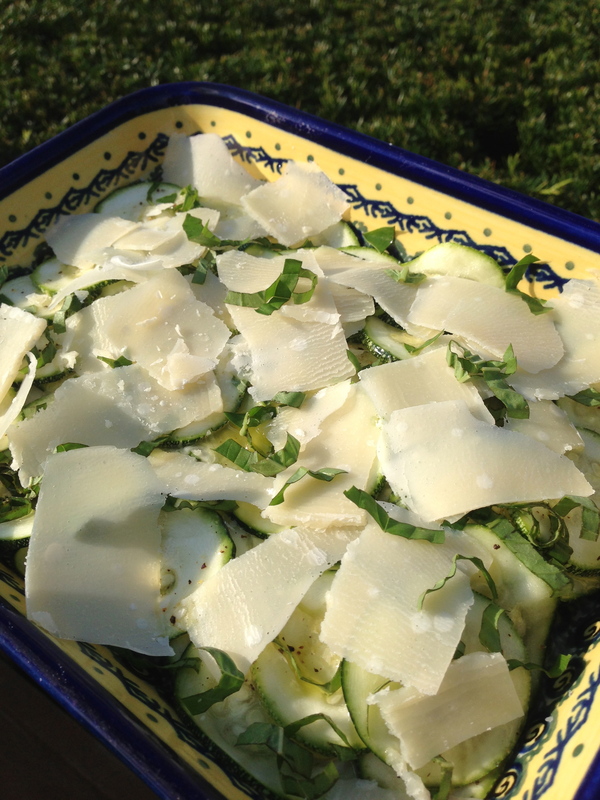 Top with the cheese shavings and sprinkle the basil chiffonade over the finished dish. For variety you could add some toasted pine nuts or walnuts — two of my go-to salad additions — for crunch, or try a different cheese (I think a mild blue would work nicely with the zucchini). Parent rating: five stars. This is such a nice balance of flavors if properly dressed and so easy to make with ingredients that are fresh and abundant this time of year. I was thrilled the girls enjoyed it too. Kid rating: four stars. Daughter 2 had two helpings and daughter 1 managed to eat three zucchini slices, which is more zucchini than I think she’s ever eaten, zucchini bread included. I think the cheese helped, but she even told me the next day that she liked the dish. We’ll try it again soon with more zucchini from the CSA.